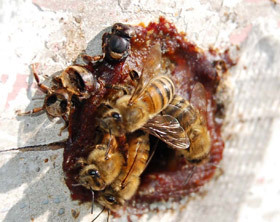 Propolis,the protection of the hive. The old Greek name "propolis" means in front of the city, and it makes mention of the defense and isolation functions it has on the hive. Thanks to propolis, bees are the insects less affected by infections, bees have been present on Earth for at least 42 million years. 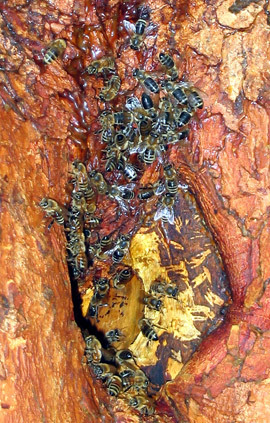 The substance bees collect from the apical buds of some plants, are later transformed into propolis. Bees use them to protect the the colony, to repair, to insulate the hive, and to make it waterproof. For humans, propolis is a powerful antioxidant, antimicrobial, antifungal, antiviral, immune stimulant, anti-inflammatory, analgesic and anti-toxic. Propolis is a natural substance produced by bees that is used for the treatment and prevention of different types of health disorders. Since ancient times it has been used to fight many diseases. The progress in analytical techniques has allowed us to study its composition and the activity of its components. The results confirm its effectiveness, especially as an antioxidant, anti-inflammatory and antimicrobial. Mielar provides you with propolis combined with other ingredients in the form of various dietary supplements to improve ones health and prevent disease. 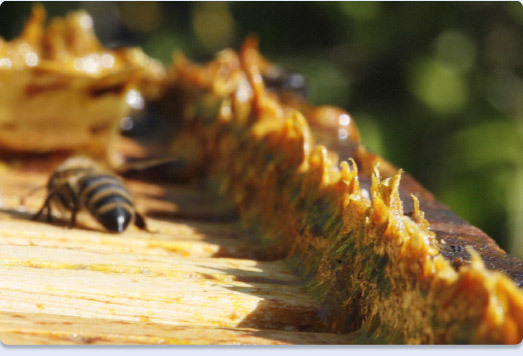 Mielar is the pioneer in the promotion and marketing of propolis in Spain. Propolis is very aromatic thanks to its content in essential oils. Depending on its botanical origin it can range in color from light yellow to dark brown. In general the taste is slightly bitter and spicy. Its consistency is ductile or brittle, depending upon the temperature. Mielars Propolis is collected from the hives through grids; a method which offers better quality and purity. In the collection, as well as in the processing, rigorous standards of hygiene are applied to avoid loss of dietary richness. Mielars Propolis is collected by bees in their natural habitat. It is harvested, processed, and packed under the best conditions to assure that its properties are kept intact until it reaches the costumer. Mielar selects its propolis, which will be used in other products with high effectiveness being their main priority. In 1982 we began to commercialize our products and distribute them all throughout Spain. Over 30 years of experience in the production and distribution of these products, makes us something quite unique in Spain. Propolis is an antioxidant, antimicrobial, antifungal, antiviral, stimulant of the immune system, anti-inflammatory, analgesic, and antitoxic. It works wonders in healing all types of wounds and is used in dermatology, ophthalmology, urology, otolaryngology, and to improve mineral metabolism and liver protection. The chemical composition of propolis, like all natural products varies depending on the environment in which it was collected; flora, climate, soil, etc- but always contains a high content of flavonoids. Flavonoids are the substances researchers attribute most of the medicinal properties of propolis. As a matter of fact honey flavonoids appear to originate in the propolis which is present in the hive, and after it passes on to the honey. Resins: 45 to 55%, flavonoids, phenolic acids and esters. Other: 5% minerals, fatty acids, etc. The flavonoids present in propolis have strong antioxidant properties, are: apigenin, kaempferol, pinocembrin, galangin, quercetin and hesperidin, chrysin, etc. Vitamins: B1, B2, B3 and B6. Minerals: Iron, zinc, aluminum, silver, barium, boron, chromium, selenium, silicon, calcium, among others. Remarkable amino acid: arginine and proline.